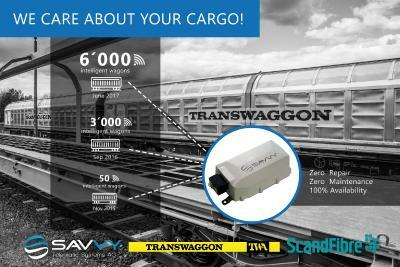 In cooperation with the freight wagon rental company, TRANSWAGGON (TWA), ScandFibre Logistics (SFL) evaluated a number of telematics providers with respect to, among other things, tracking goods (via GPS/GNSS). 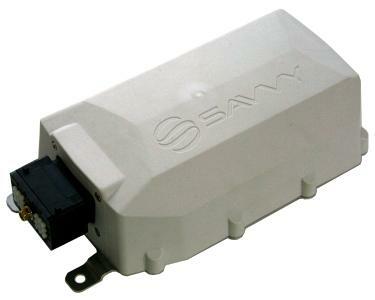 Choosing from a number of telematics providers, both companies decided on the Swiss firm, SAVVY® Telematic Systems AG. SAVVY best meets the high requirements of TWA and SFL, and proved to be the most reliable and competent telematics provider. Functionalities on the 50 TWA freight wagons used across Europe in SFL transport and SAVVY team's service quality were then subjected to intense testing. Battery drain in the cold Scandinavian countries, the accompanying risk of battery self-discharge, and the configuration flexibility of the SAVVY® Cargo Trac-I telematics units were a major focus. 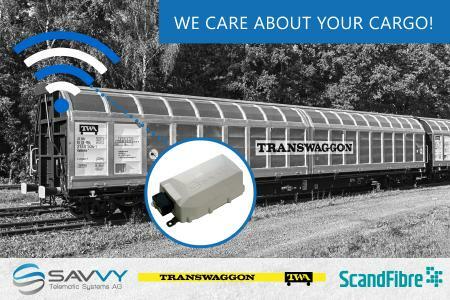 SAVVY provides precise position data in real-time along the entire route – from freight wagon loading to unloading – with an accuracy of up to 2 metres including shock detection with configurable thresholds in x.y, and z axes. At over 1000 POIs (points of interest, also known as geofences) such as loading and unloading points, or switch yards, the distance (air or rail route) up to the next 10 POIs is displayed with each position report. In addition to transmitting position data and the resulting route deviation and performance data, the system provides additional shock detection data. Completely maintenance-free telematics devices, precise and reliable data, robustness and stability even under the harshest conditions at temperatures of up to -40°Celsius are compelling. In November 2016, TWA, SFL, and SAVVY signed a 5-year (GPS information) contract. 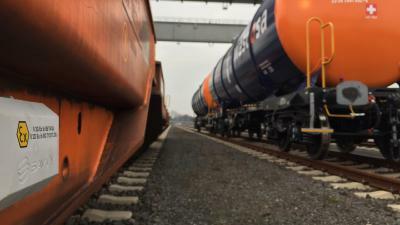 Installation on the rest of the 3,000 freight wagons will begin in February 2017. “All three companies complement each other perfectly, and have introduced something uniquely innovative into the process of digitalising transport and logistics for the forestry and paper industries on the Scandinavian market. We are proud we can provide top quality even under the harshest climatic conditions. The competitive advantages are obvious!” - Paul Kaeser, CEO SAVVY® Telematic Systems AG. “Because we are a company that works across borders, with the daily challenge of distributing vacant wagons also used for forwarding goods, it is always important for TWA to know where its approximately 13,500 freight wagons are located. We already have a specially developed market-leading planning system in place. With SAVVY Telematic Systems we can now easily also show our customers exactly where their goods and wagons are located with an accuracy of two metres. 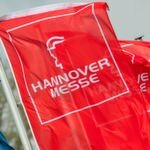 Digitalisation makes it possible to provide new generation information access to our technicians, transport planners, and current and future customers. Regardless of country and on which railroad the goods are shipped. We plan to develop the TRANSWAGGON brand systems so that they do more than just record geo-data, and, under the name TWA Freight Buddy, TFB for short - provide all of our customers with improved digital services for their goods transports.” - Managing Director Anders Nilsson, TRANSWAGGON AB, Helsingborg. For 52 years now, TRANSWAGGON (www.transwaggon.com) has specialised in providing freight wagons across Europe to ship all types of dry goods. The TRANSWAGGON Group currently has about 13,500 modern freight wagons in circulation. Of these, about 1,700 are flat wagons and approximately 11,800 covered and covered sliding door wagons. For the most part, the wagons are equipped with a number of features to facilitate loading or protect the load. In addition to developing customer-specific transport means for rail and its long-standing experience in organizing wagon maintenance and repair, TRANSWAGGON also continuously improves its own wagons and service portfolio. This includes classic long-term leasing, renting wagons for trip charters, block train service, and full-service forwarding for railroad shipments. SFL (http://scandfibre.se) is the largest transport and logistics company in Sweden specialised in rail transport for Scandinavian forestry companies. SFL stands for fast, consistent, and inexpensive shipments for forestry products from paper factories throughout Scandinavia to terminals and ports in Sweden and continental Europe. SAVVY® Telematic Systems AG, headquartered in Schaffhausen, Switzerland, is an M2M technology service provider specialised in telematics-based business intelligence and fleet management. SAVVY® combines hardware, software and process consulting expertise to provide comprehensive services for industrial and logistics companies. The aim is to increase added value in these companies through efficient work and logistics processes. 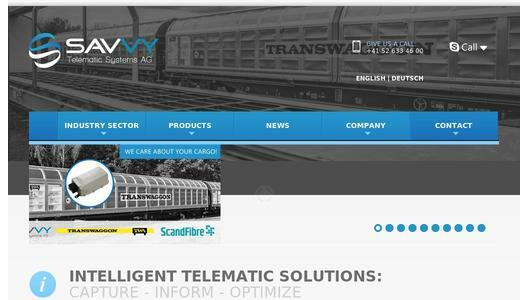 SAVVY® links telematic system solutions for use in vehicles, machines, rail freight wagons, and tank containers with highly developed business intelligence technologies, and a state-of-the-art portal. The range of services also includes far-reaching process consulting and intelligent process design for all telematics-based business processes. 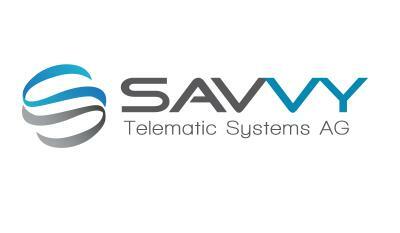 The team at SAVVY® Telematic Systems AG consists of hardware and software engineers, project managers and logistics specialists committed to working with their clients toward increasing customers' added value. SAVVY® joined the SDAX-listed INDUS Holding AG Group (www.indus.de) in May 2014. State-of-the-art-Telematic solution: Top swiss quality even under the harshest climatic conditions of up to -40°Celsius!